A low-cost infant incubator is designed to combat two of the three leading causes of infant death. The first few weeks of life are critical for premature and low birth weight babies, as their ability to regulate their own body temperature is not fully developed. Placing the baby in an incubator, essentially a man-made version of the womb, helps maintain an infant’s temperature and environment. However, the use of incubators in low-resource countries is much more difficult, as the products are generally too expensive. “The statistics, especially in lower source environments, are pretty grim: About every 10 seconds a baby dies, and usually it’s due to problems of hypothermia or sepsis,” says Govind Rao, Ph.D., professor and director at the Center for Advanced Sensor Technology at the University of Maryland Baltimore County (UMBC). “Low birth weight has become increasingly common as women defer childbirth. If you had an inexpensive way to intervene and keep baby warm, it would have a dramatic impact.” Rao added that premature babies born in these environments are also at risk of infection, because the incubators are not always effectively cleaned and sanitized. This means that as one sick baby leaves the incubator, the next baby coming in is highly susceptible to accepting the infection. “That becomes a highly problematic issue leading to high mortality,” says Rao. Govind Rao and his team of students at UMBC have been committed to improving the odds for preemies and low-birth rate babies in low-resource environments. What started as a class project evolved into the development of a low-cost and disposable cardboard incubator designed to prevent neonatal mortality as a result of preterm birth and/or infection. Rao assigned the students in his sensors class a research project to develop a design for a low-cost incubator that would maintain the baby’s temperature and use as many locally available resources as possible. After the student teams came up with their designs, they took a field trip to India, visiting rural healthcare centers to find out what happens on the front lines. “That was eye opening,” says Rao. 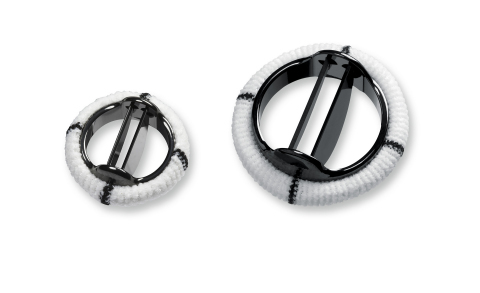 “Many [medical device] developments tend to be done at research hospitals with experts in the field. When we went into the frontlines and interviewed the midwives, we got a very different picture.” In one of the primary centers visited by students, the availability of incubators was scarce. One incubator wasn’t working and the hospital couldn’t get it serviced, and the other incubator was used infrequently due to cultural reasons (The incubator was located down the hall from the mothers who had anxiety about being separated from their baby. The lack of a tagging system creates fear that a baby will be lost, switched or kidnapped.). The midwives requested an inexpensive incubator that could be placed next to the mother to not only eliminate the security and anxiety issue but also to promote kangaroo mother care (KMC), a widely accepted and desirable way of mother-baby bonding that involves skin-to-skin contact. 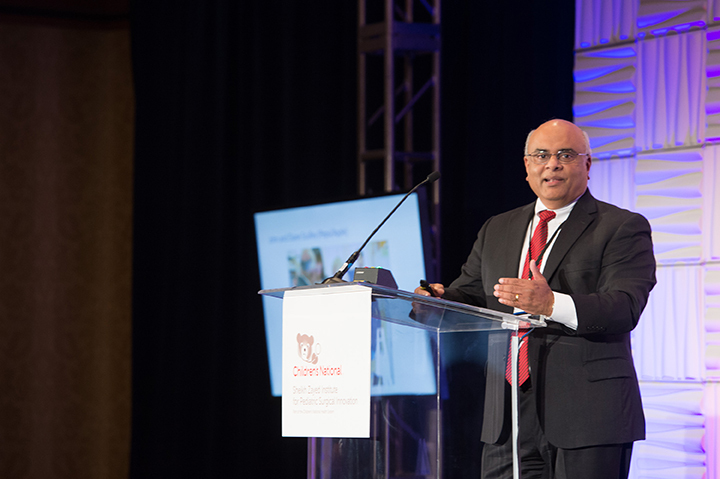 “You really have to go that last mile into the field and see who your end user is.” – Govind Rao, Ph.D. The UMBC team used the feedback to further refine the device. The ultimate design consists of three components—the cardboard incubator, a temperature controller and a solar powered battery that can be charged throughout the day. A temperature sensor is affixed to the baby and placed in the incubator, and the sensor feeds back to the controller, which has a heater that gently warms the air and pumps it through the incubator via a three-inch duct. It also has an air filter for dust. 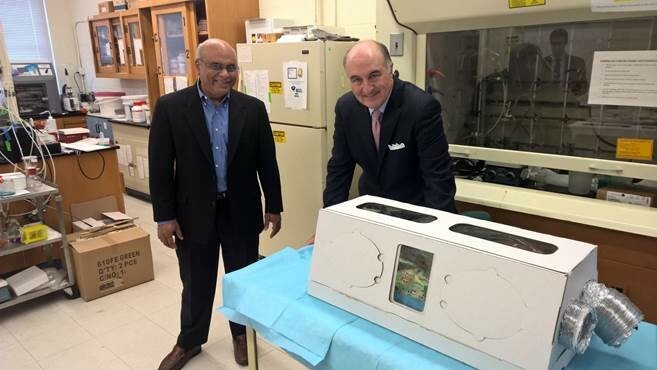 Govind Rao, Ph.D., and and R. Michael Gill, Maryland’s Secretary of Commerce, with the incubator. Rao filed a provisional patent for the cardboard incubator, let it expire and then put it back in the public domain as part of the process of finding a manufacturing partner. “The need [for the incubator] was so enormous that no one company can do it, because you’re going to need it in the millions,” says Rao. “If we made it an open source product, others could copy the design and we would supply the key part, which is the temperature controller.” Rao selected Phoenix Medical Systems as its manufacturing partner to take the design to commercialization. The 5th Annual Pediatric Surgical Innovation Symposium will be held on Sunday, September 24 in San Jose, CA. Six innovations will receive up to $50,000. The FDA-funded consortium is led by the Sheikh Zayed Institute for Pediatric Surgical Innovation and A. James Clark School of Engineering at the University of Maryland.The incubator is currently in clinical trials in India. 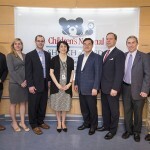 The next stage will be pursuit of the CE mark, says Rao, acknowledging that the development of the incubator and the clinical trials couldn’t happen without the funding they received from the National Capital Consortium for Pediatric Device Innovation’s annual Pediatric Surgical Innovation Symposium. Last year UMBC was one of 12 finalists in the competition and went on to win the $50,000 award. In addition to the help that the funding provided, the approach of using undergraduate engineering student resources made for a cost-effective product development paradigm. The team could quickly test multiple versions of the design to ensure they could attain relevant metrics such as temperature control. 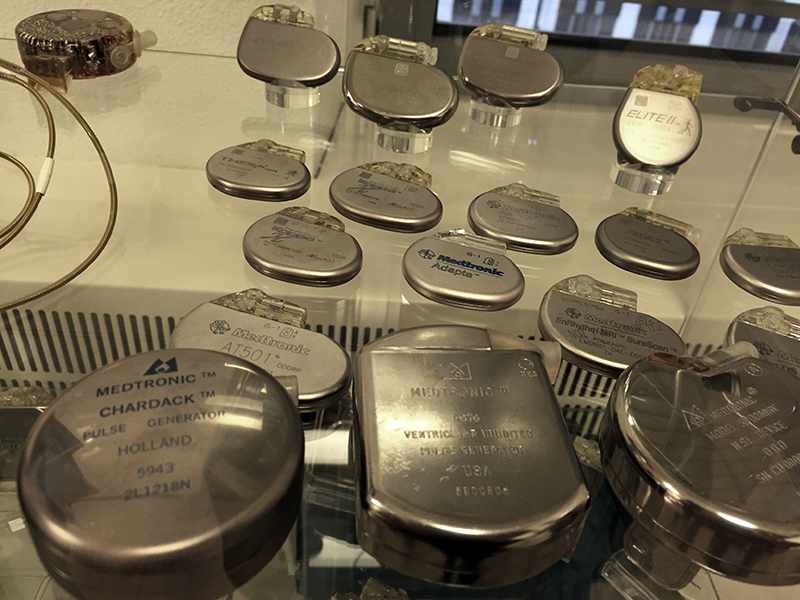 When the design was transferred to Phoenix Medical, the company built a low-cost controller similar to the ones that the company uses in its high-end systems (and are also already CE marked). The incubator has a tremendous potential, because it is being designed for use off the grid. It costs less than $5, and the cardboard unit can be assembled in just two minutes. Organizations including the Red Cross and the U.S. Department of Defense have also expressed interest in the product for disaster relief. Due to the scalability of the platform, Rao wants to increase its usage by making the design available on the internet. Phoenix Medical agreed to sell the controller module at a modest profit margin to make sure it’s sustainable. In addition, Rao’s class continues to develop other sensors that could add value to the incubator, potentially expanding its application into telemedicine. Students have developed different sensors that can monitor heart rate and breathing. Another sensor can remotely measure a baby’s weight in the incubator, which could have a big impact, as malnutrition is an enormous problem in the developing world. “With this weight sensor, you can now imagine where the incubator becomes a smart device that transmits the weight of the baby daily to a centralized facility and the baby is tracked,” says Rao. “There’s an amazing digital revolution going on in places like India.” Students also developed a webcam-based modem that transmits images of a baby over the phone. When thinking about technology solutions to medical challenges, Rao emphasizes that access to healthcare isn’t the only issue. It’s about affordability and developing technology that truly lowers the cost of healthcare. Grateful to all our supporters (VentureWell, NCC-PDI) and the Sri Ramchandra Medical College team led by Dr. Binu Ninan. Let’s save those precious babies. This is wonderful collaborative life saving work. Congratulations Dr Rao and his students.